PHILADELPHIA- (March 19, 2014) – Comcast SportsNet debuts the new broadcasting team of Jamie Moyer, Matt Stairs, Tom McCarthy and Gregg Murphy on Monday, March 31 when the Phillies take on the Texas Rangers in the 2014 season opener. This will mark the first of 161 high definition broadcasts on Comcast SportsNet, The Comcast Network and NBC10. 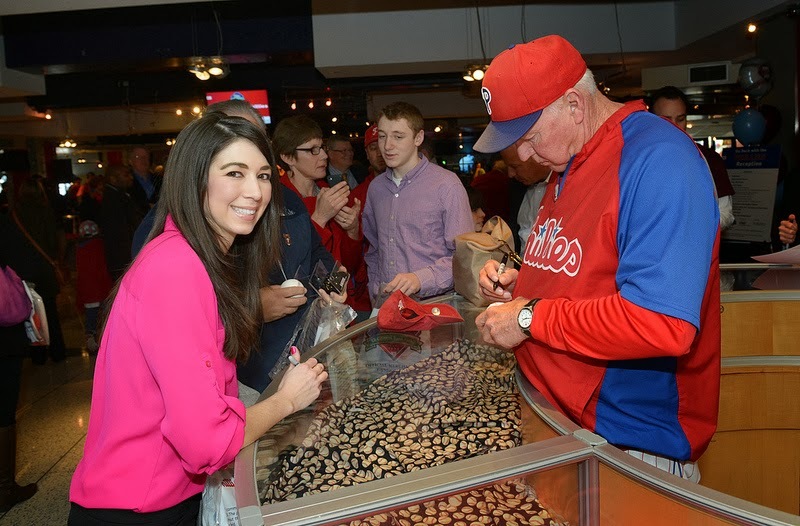 Hall of Fame third baseman and Phillies legend Mike Schmidt also joins the Phillies broadcast team for the 2014 season. The three time National League MVP will be on the air for all thirteen Sunday home games for special Sundays with Schmidt broadcasts. Schmidt, Moyer and Stairs will work as analysts for the 2014 season, working alongside play-by-play man Tom McCarthy and field reporter Gregg Murphy for games on Comcast SportsNet, The Comcast Network and NBC10. In addition to Comcast SportsNet’s stellar broadcasting crew, two additional former Major League players Ricky Bottalico and Ben Davis provide expert analysis on Phillies pre and postgame shows, as well as the network’s news and talk programs throughout the season. Bottalico returns for his sixth year as a Phillies analyst after playing 12 seasons in the major leagues, including seven with the Philadelphia Phillies and an all-star appearance in 1996. Returning to the lineup this year is Davis, a catcher and first round draft pick from Malvern Prep, who played seven seasons in the majors. 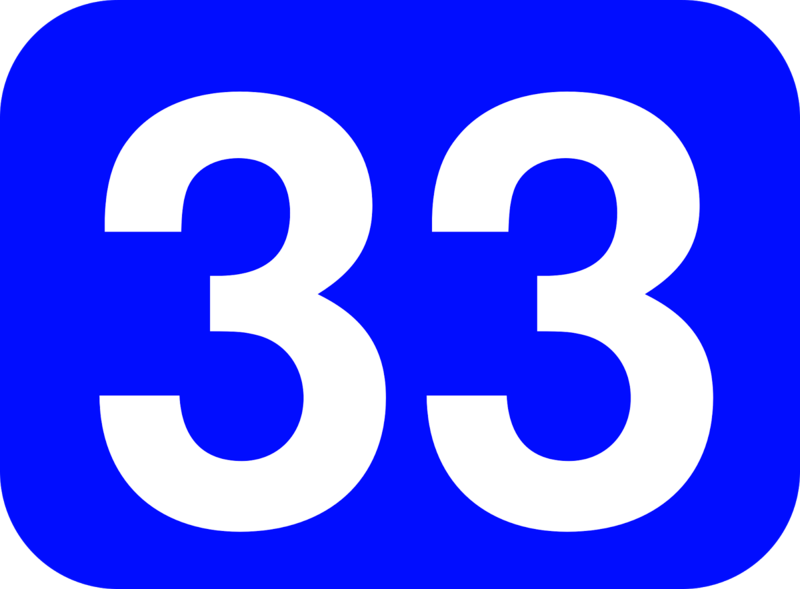 Throughout the 2014 season Comcast SportsNet will provide comprehensive Phillies coverage across multiple platforms, including the network’s online home, CSNPhilly.com, and social media sites Facebook, Twitter and Instagram. Here's the TV coverage for the Phillies Home Opener on April 7th at 3:05 PM - broadcasted on NBC10 Philadelphia. *Phillies Clubhouse makes its 2014 debut on Monday, April 7 at 7 p.m., and features a special look back in conjunction with the team honoring 10 seasons of baseball at Citizens Bank Park. Exclusive video will reveal the top 10 moments from the first 10 years at the Phillies ballpark, all chosen by more than 43,000 fans through a phillies.com online vote held earlier this month. All Comcast SportsNet and Comcast Network broadcasts will be in high definition and will feature a new graphics package, updated score bug technology and enhanced statistical data. Jim Salisbury (@JSalisburyCSN), Marshall Harris (@mharrisCSN) and Leslie Gudel (@LeslieGudel) team up for comprehensive Phillies coverage during the 2014 season. 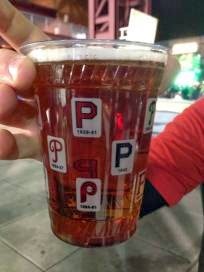 As CSNPhilly.com’sPhillies Insider, Salisbury will report on the team both at home and on the road, providing feature stories, and Phillies chats for the website. 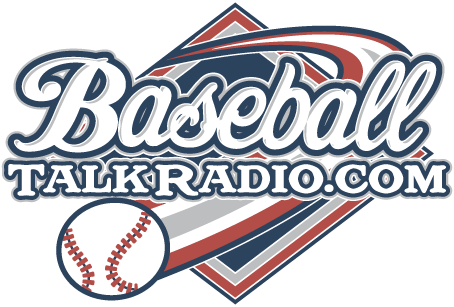 Gudel and Harris will provide coverage on-air and online, including exclusive interviews and feature stories on the players, coaches and personalities that make the Phillies tick. Following each match-up, Phillies fans get a game breakdown with stats and highlights, and a look ahead to the rest of the season on “Phillies Postgame Live.” Other features include manager Ryne Sandberg’s press conferences and reaction from the clubhouse. Phillies Postgame Live analysis will be provided by former Major League ball players Ricky Bottalico and Ben Davis. Completing Comcast SportsNet’s Phillies lineup is the weekly 30-minute feature series Phillies Clubhouse. “Phillies Clubhouse” illustrates the deep bond between the Phillies and their fans with in-depth player interviews and behind-the-scenes stories about fans and the people who make the team run. We’ll look into the future of the game with regular minor league updates. The show will also feature in-depth breakdowns by analysts Ricky Bottalico and Ben Davis, giving viewers new insights into what happens on the field. “Phillies Clubhouse” debuts on Monday, April 7 at 7 p.m. with a look back at the top 10 moments in Citizens Bank Park. 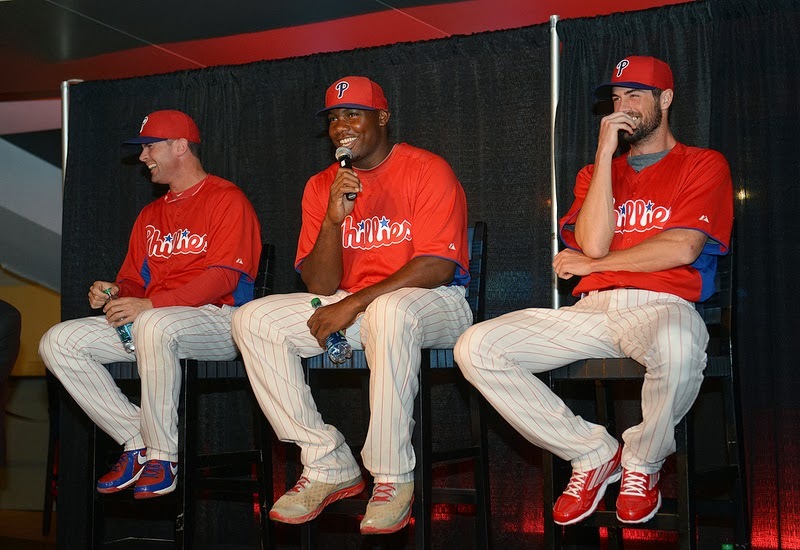 “Phillies Clubhouse” will air most Mondays at 7 p.m. on Comcast SportsNet. CSNPhilly.com’s Phillies Insider Jim Salisbury (@JSalisburyCSN) will provide exclusive player, coaches and management interviews, plus breaking news and in-depth features on CSNPhilly.com. 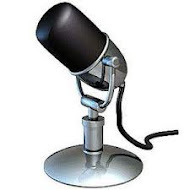 He will also provide live reports for “Philly Sports Talk” and “SportsNite.” CSNPhilly.com columnist John Gonzalez (@GonzoCSN) will also contribute to the site throughout the season. CSNPhilly.com’s popular Phillies-themed online show, “Phightin Words” returns with Bottalico and Davis discussing the Phillies and responding to trends, answering fan questions from Twitter and Facebook, and dissecting upcoming series and player performance. Fans can join the conversation by using the hashtag #PhilliesTalk. Fans can also follow all games online with CSNPhilly.com’s “In-Game Live” feature, which allows fans to follow the game live with play-by-play, stats and Comcast SportsNet tweets. The Phillies take on the Pittsburgh Pirates tonight at CBP for the first of two scheduled "On-Deck" series games. The Pirates have a strong showing so far in Spring, and these two games will count towards the Spring Training totals for both teams. The Pirates have an energized team built around Andrew McCutchen, who was the NL MVP in 2013. McCutchen has been on fire in Spring with a .560 BA going 14 for 25 so far. 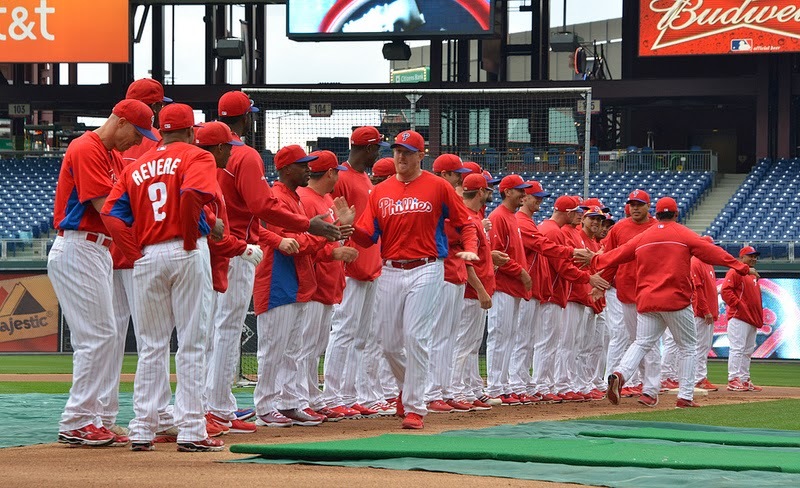 Spring Training in Florida is over for the Phillies and now it's on to Philadelphia for two games with the Pirates for the On-Deck series that a lot of fans get an early look at the team. The Phillies team that will be on the field on Friday night has taken some dramatic changes in the past couple days as a few players that we thought would be with the team at the start of the season will not be with them. 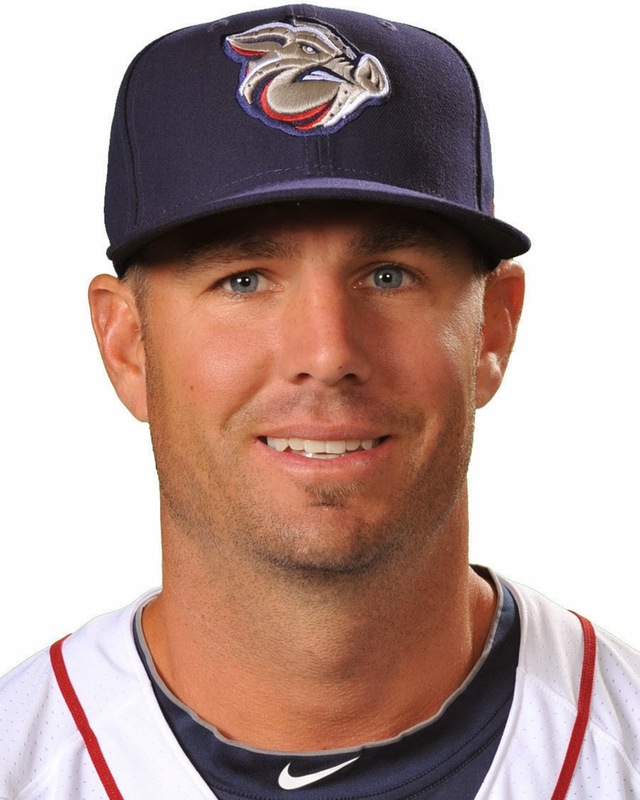 Kevin Frandsen was expected to be on the team off the bench for the Phils, but he was demoted and refused the assignment down to the minors and promptly announced that he would seek another team. That other team is the Washington Nationals who quickly signed Frandsen to a deal that he had with the Phillies, a 1 year contract for $900K. Frandsen was good insurance for the Phillies if they had an injury at the corners this year, first and third base. Now, he is not an option. Bobby Abreu was given a chance to make this Phillies team, he too was battling for a bench spot. Abreu didn't disappoint, he hit 3 doubles, 1 triple, and had 10 BB and chipped in 10 RBI with only 6 SO for the Phillies, but somehow, that was not enough. Should have Abreu made this team with those numbers and being so hot in the Winter League last year. He should have made this club as well with the numbers he put up, but didn't. A lot of Phillies moves lately aren't adding up. What added up for the Phillies in a bad way has been their Spring winning percentage, at present they are the worst team in the MLB on a winning percentage basis. The team is 9-17 with a .346 WP, the Boston Red Sox are just above them with a WP of .360 so far. The Phillies can still try to avoid being the worst team in the league by winning the two games against Pittsburgh that will be played on Friday night and Saturday afternoon. Maybe the pundits are right about this Phillies team, they've predicted the team to be one of the worst teams in baseball this year. ESPN had the Phillies finishing 29th of 30 teams. We can't really count Spring but plenty of Phillies fans are nervous that things just aren't right with this team anymore. Jimmy Rollins has been a long time Phillies player, he was the NL MVP in 2007 but recently it's been reported that he may be on the trading block for reasons that are unknown to him. Just a few days ago, Rollins sat the bench for 3 straight games, and the explanation from new skipper, Ryne Sandberg, was that he just wanted to see Freddy Galvis play 3 games in a row. That might be the case, but Rollins has went public to say that he thinks this goes deeper than that explanation and he doesn't have a clue as to why he's the guy singled out so far in the 2014 season. Last night, this story went viral amongst sports news organizations. Most of these pundits say that Rollins is on the trading block and could be traded real soon. Jimmy Rollins has at least 10 years service with at least 5 years with one team, and that gives him certain rights of not being traded to certain teams. It's not clear who if any teams have been interested in Rollins, but it's been reported that he doesn't want to go to Detroit. Rollins has had his run ins over the years with former Phillies manager, Charlie Manuel, but it's not clear that those issues are still bothering Sandberg, or that the team is just wanting to move in a different direction. A shortstop is generally not the main generator of offense, and the fact that the Phillies weren't successful last year shouldn't fall on Rollins' shoulders, if anything the Phils should look higher up the salary chain to find those problems in a player named Howard, but that is a different story. We'll see how this story shakes out over the next couple of weeks, it's the Phillies first somewhat sensational event to happen out of Spring Training and it's got the press on fire with rumor. Darin Ruf is leading the Phillies in RBI's about half way into the Grapefruit League but still won't be a starter on Opening Day. Ruf, who has been trying to gain a spot on this Phillies team has been a potential diamond in the 'rough'' for a while now, but the Phillies don't have a starter's role for him. Ruf is tied at the top with a couple other Phillies for most hits in Spring Training so far with 10, he's been patient at the plate with 5 BB's as well. In the last 2 years, Darin Ruf has played in only 85 games as a Major Leaguer despite smacking 38 HR for Reading on the Phillies AA team in 2012. I think if the Phillies had Mike Trout in their minor league system, he'd still be in AA the way the Phillies don't want to promote young talent. This is where the Phillies have gone wrong in the past couple years. Despite this, Ruf remains optimistic and feels good in his second year in Phillies Spring Training camp. Here's a special offer for readers of the FightinPhillies.com blog to get inside and personal with the 2014 Phillies. 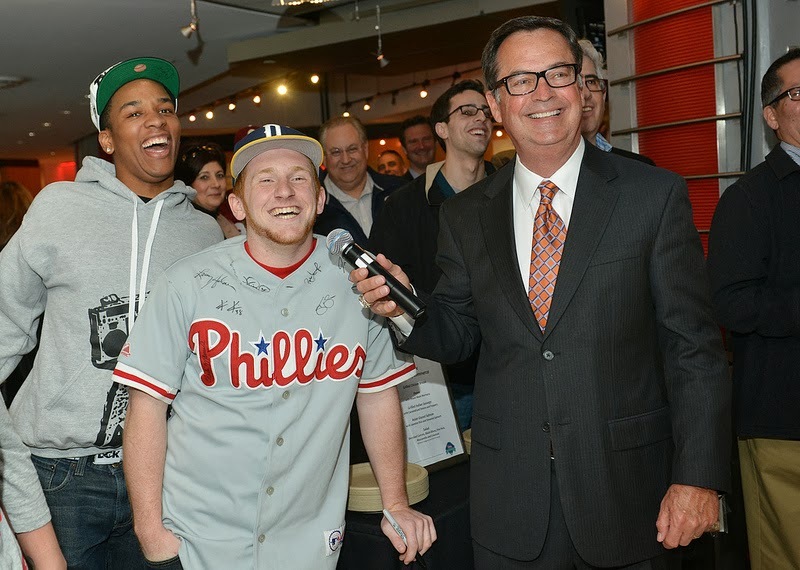 The Philadelphia Chamber of Commerce is sponsoring this special event that is unlike any other you'll find on the Phillies schedule this year. 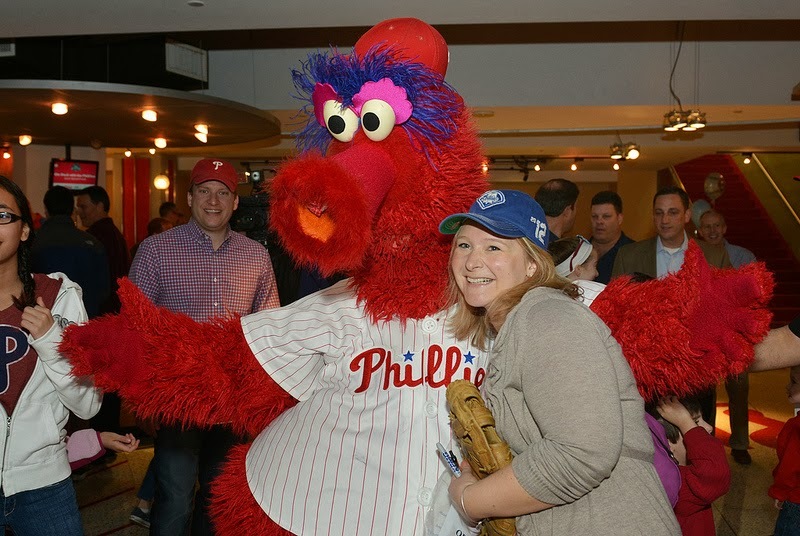 Your afternoon will start on March 28th at 2:00pm at Citizens Bank Park in the Diamond Club with food and drinks being served starting at 2:30 PM, this is included in the price of the ticket. A question and answer session with Phillies coaches and players along with autographs will then start from 2:45pm to 3:45pm. You will then go on the field from 3:50pm to 4:30pm for an on-field presentation (weather permitting) and then the program is adjourned. Your ticket also includes a game ticket that features the Phillies and the Pittsburgh Pirates in an exhibition game that starts at 7:05 PM. It's all for a special price of $95.00 - but if you use our special code that is for readers of this blog, you can save an extra $5 off each ticket price, just use PhillyBlog1 at checkout and you'll save $5.00 each ticket, order your tickets from the Philadelphia Chamber of Commerce here. Ryan Howard is still struggling with left handed pitching when they throw him a breaking ball. It's been something that he's struggled with for his entire career. Why doesn't he practice this all the time? Very strange that he hasn't been able to figure this out so far. Here's an at-bat from yesterday against the Astros, I think you can predict what is going to happen next. Howard will have to be in a position to lead this team this year, he's making $25M for 1 season to play baseball for the Phillies but hasn't solved one of the things that he should have by now.